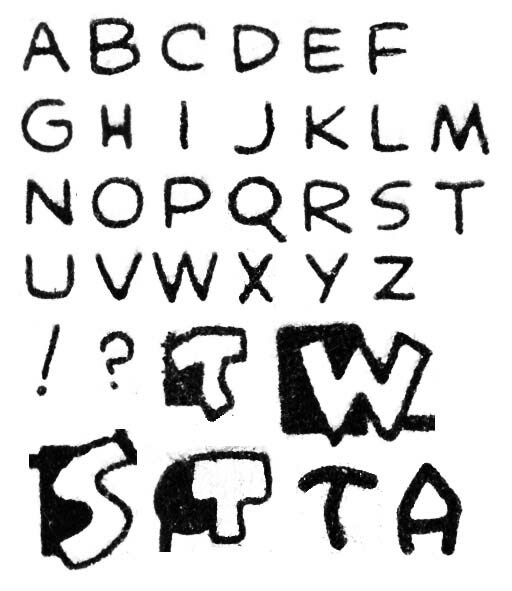 Posted October 29, 2011 in 2011/10, 3 Timely, Artists, Assorted, Kirby, Jack, Lettering, Periods, Serial Posts, Start of S&K, Topic, z Archive. 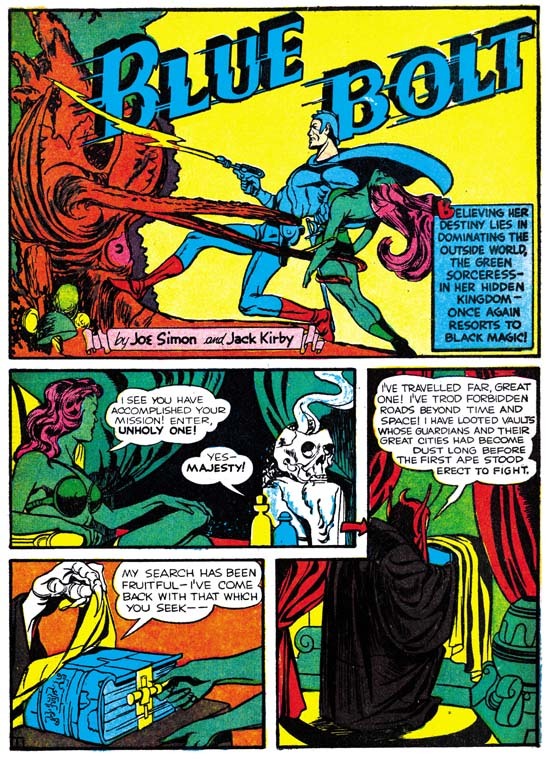 Blue Bolt #5 has the distinction of being the first time that the Simon and Kirby collaboration was credited in print. BB #4 was every bit a Simon and Kirby production but in the splash it was credited to Joe Simon alone. It is little more than speculation, but perhaps when Joe saw the final results of BB #4 he realized that Kirby’s contribution had gone well beyond being just an assist and that Jack deserved a greater recognition. Since BB #5 was penciled by Jack and inked by Joe, why did Simon get top billing? The simple answer was that Blue Bolt was a Joe Simon creation. While this is very understandable, once this particular order appeared in print from then on it would Simon and Kirby, not Kirby and Simon. Blue Bolt #5, like issue #4, is a great piece. Simon and Kirby full of action and visually exciting art. Blue Bolt may not have been a top selling comic book, but anyone paying attention should have realize that the Simon and Kirby were producing something unlike what anyone else was doing. Was Blue Bolt written by Simon and Kirby as well? In the future Simon and Kirby would generally employ writers to develop scripts. However Joe and Jack normally supplied the plot and just as often re-write the returned scripts. We may not know whether Simon and Kirby were working from a script or not for BB #5, but they clearly were involved in the plotting. 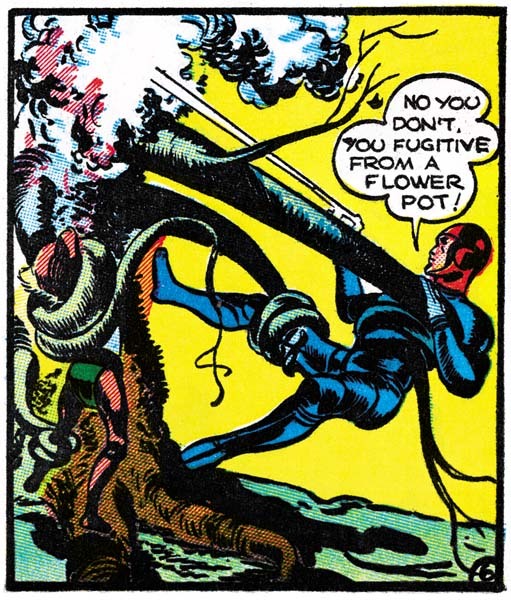 A man-eating plant appears in the Comet Pierce” story from Red Raven #1 a couple months earlier. The Comet Pierce story seems to be a largely Kirby effort but since Simon was the editor to Timely he may have had input to the story. Howard Ferguson did the lettering for Blue Bolt #5. The form of the general letters has not changed at all from Daring Mystery #6 (September 1940). The special first letters of captions continue to have attached circular or square black shapes. However now these special first letters have migrated to the caption border so that small parts of them may actually extend outside of the caption box. Another addition to the Ferguson repertoire is that some of the captions have first letters that are slightly larger and oddly angled. This angularity sometimes appears in the letters with square or round backgrounds as well. 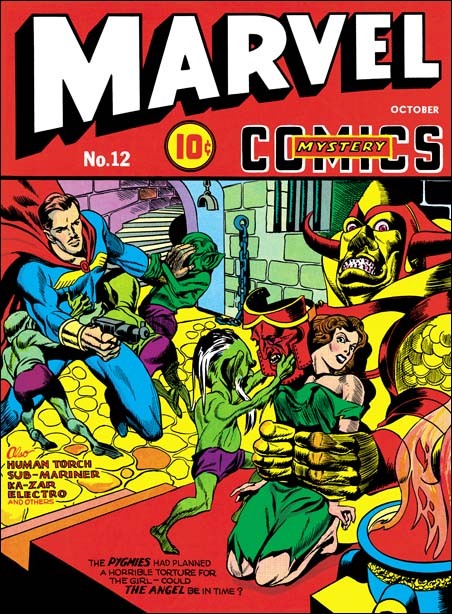 In October Simon and Kirby also provided the cover art for Marvel Mystery #12. Featured on it was the Angel. It would be the last appearance of the Angel on a cover of Marvel Mystery Comics as the Human Torch or the Sub-Mariner would dominate all future covers. Kirby did the pencils for MM #12 with Simon adding the inks. The lettering on the cover was done by Kirby (note the horseshoe shaped ‘U’). More time and energy was expended on covers as compared to lettering the story. So it is not surprising that Kirby, who like Simon was normally a rather unprofessional letterer, could provide a real nice job lettering the cover. I too have a “curious incident” to draw attention to. While Simon and Kirby created a number of pages for Timely comics for August and September the MM #12 cover was the only art they provided for October. Now I have to admit there was one Fiery Mask story that could have been done at this time period but I have good reason to assign that work to November and will cover it in the next chapter. But even if it was done in October it was drawn and inked by Simon, what happened to Kirby? One possible explanation was there was such art but it was created for Red Raven #2 which should have appeared in October. However the Red Raven title was abruptly cancelled well before any indication of how well Red Raven #1 sold. Timely owner Goodman apparently had come to realize the popularity of the Human Torch and the Sub-Mariner and decided to launch titles dedicated to them. Licensing fees could be saved by canceling Red Raven Comics and using that license for the Human Torch Comics which is why that new title started with issue number 2. There is also another explanation for this deficit of Kirby art but that will also be discussed in the next chapter of “In the Beginning”.